Nationality: American. Born: Sterling Relyea Walter in Montclair, New Jersey, 26 March 1916. Education: Attended Brown-Nichols School, Wassookeag School, and others before dropping out at age 17. Military Service: Joined the Marine Corps, and later with Office of Strategic Services serving in Greece and Yugoslavia, 1943–45; served under name John Hamilton. Family: Married 1) the actress Madeleine Carroll, 1942 (divorced 1945); 2) Betty Ann DeNoon, 1947 (divorced 1955), four children; 3) Catherine McConnell, 1960, two children. Career: 1930s—left school and became ordinary seaman on schooner Puritan , and served as first mate on Yankee on round-the-world voyage, 1935–36; then captain of brig Florence C. Robinson , 1938, and owner of schooner Aldebaran , 1939; 1940—contract with Paramount: film debut in Virginia , 1941; 1946—member of Communist Party for 6 months; 1950–51—after being blacklisted, voluntarily submitted to questioning by House Un-American Committee; 1959—voyage with his children aboard his schooner The Wanderer became subject of his autobiographical work Wanderer ; 1973—stage appearance in Are You Now or Have You Ever Been ; 1976—published the novel Voyage ; 1982—in TV mini-series The Blue and the Gray. Died: In California, 23 May 1986. Wanderer , New York, 1963. Voyage (novel), New York, 1976. Interview, in Films Illustrated (London), February 1981. Interview with B. Berg, in Cahiers du Cinéma (Paris), June 1986. Gow, G., "Vibes," in Films and Filming (London), December 1973. Ciné Revue (Paris), 30 October 1980. Obituary, in Variety (New York), 28 May 1986. Beaver, J., "Letters," in Films in Review (New York), March/April 1992. Roberts, J., "Letters," in Films in Review (New York), July/August 1992. Pharos of Chaos , directed by Wolf-Eckhart Bulher and Manfred Blank, West Germany, 1983. 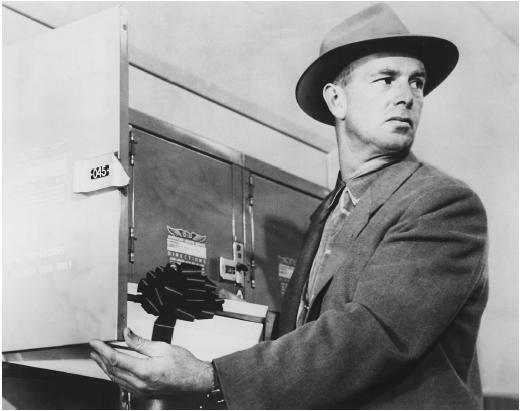 Throughout his career, Sterling Hayden maintained that acting in film was only a means to an end, getting together enough money to buy a boat and go to sea. The claim has not been mere studio hype: from 1941 until the early 1980s Hayden worked only enough to finance his ocean voyages which he chronicled in his best-selling autobiography Wanderer , a book that says much about life and ships and little about movies. Though he repeatedly denied his talent as an actor, he made several screen appearances that display his rare capacity for erasing the line between acting and being. Playing such roles as the hired gunman who dies trying to get back to his horses in Kentucky in The Asphalt Jungle , the hardboiled leader of a doomed gang of race track thieves in The Killing , and the mad General Ripper who destroys the world in Dr. Strangelove , Hayden has become fixed in the public mind as the doomed man of conviction, the man who lives and dies by a bizarre and somewhat perverted moral code. His portrayals in those three films highlight a career that saw Hayden move from quiet, handsome leading man to weathered character actor. In his later films, most notably The Long Goodbye , Loving , and Hard Contract , he is a bearded, self-confident, and possibly mad Ahab who has forgotten that the meaning in his life came from searching for the whale. Hayden, who in later years lived in a barge on the Seine, was always the uneasy hero in a series of Westerns and crime films, most at Republic. Hayden's early screen characters might hold a grudge or have a goal, but they just didn't want to talk about it. His more recent characters want to do nothing else but talk about their lost goals and dreams. Perhaps it was his unconventional lifestyle that led directors to seek him out for the slightly neurotic heroes of films in the 1950s. The Asphalt Jungle and The Killing are good examples, but even more striking is his appearance in eccentric B pictures such as Terror in a Texas Town directed by Joseph Lewis. In this film Hayden plays a seaman who finds himself in a shootout with a gunman. The twist is that instead of a gun Hayden carries a harpoon. In Valerie , directed by Gerd Oswald, who directed Marlon Brando in The Wild One , Hayden played a Westerner who is viewed in radically different ways by the witnesses at a trial for murder. In this variation on Rashomon , Hayden's character proves to be as much of an enigma as the actor himself. It is somewhat ironic that Hayden's most visible performance was in The Godfather as the corrupt policeman who is shot by Michael Corleone (Al Pacino). In the film Hayden's character is neither mad nor misunderstood. He is coolly and cruelly corrupt, a chilling facet of the Hayden persona that was seldom explored. Let him rest in peace.He was one of the greatest American actors durinf the 1940 and 1950,I saw most o9f his films in Iraq,Baghdad,the country which has been invaded and destryed by American troops in 1991 and 2003.